Zcoin has seen a 4.97% price decrease over the past 24 hours of trading. The cryptocurrency is currently exchanging hands at a price of $12.46, after seeing a 4% price decline over the past 7 trading days. This price decline is apparent across all cryptocurrency markets as their US dollar values are largely tied to the BTC dollar value. At the time of writing, BTC has dropped by 4.46% over the past 24 hours of trading, briefly dropping back below the $7,000 handle. 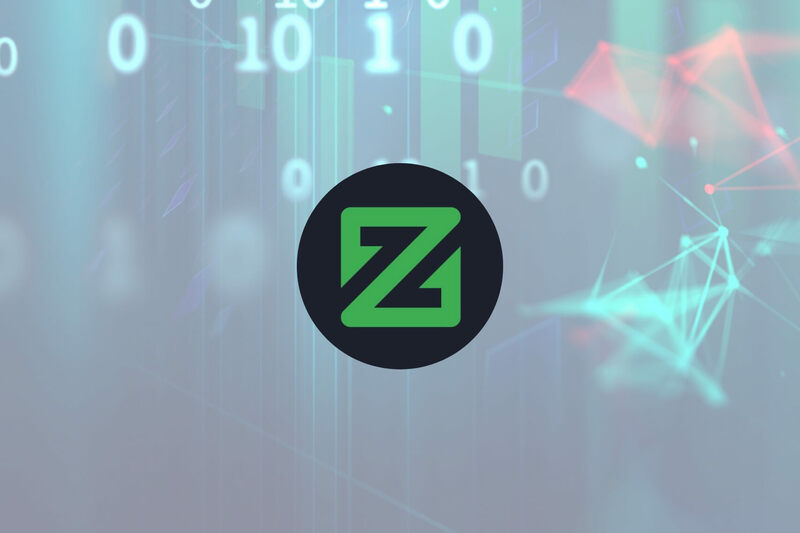 Zcoin is the first cryptocurrency to implement the Zerocoin protocol upon its blockchain to provide anonymous and private transactions. The implementation of the Zerocoin protocol uses Zero-knowledge proofs to allow users to send coins without leaving a transaction history. Launched in September 2016, the 23-month old coin is currently ranked 93rd in terms of overall market cap across the entire cryptocurrency industry. XZC has a total market cap value of $69.44 million after suffering a precipitous 56% price decline over the past 90 trading days. Let us continue to look the cryptocurrency’s price action over the long term. Analyzing the market over the long term, we can see that the market had experienced an incredible bullish run toward the end of 2017. Price action started from a low of $11.53 on November 2, 2017 and extended to an all-time high of $186.29 on December 26, 2017. This was a price increase of 1,660% from low to high. We can see that after placing the all-time high, price action went on to decline rapidly. It had initially found support at the long-term downside 1.272 Fibonacci Extension priced at $38.30 during February 2018, but the bearish pressure continued pushing the market lower to find further support at the long-term downside 1.414 Fibonacci Extension level priced at $27.13 in March 2018. The support at $27.13 continued to hold throughout March, April and May of 2018 but price action penetrated below this level during June 2018. We can see that the market has continued to fall as it recently approached support at the long-term downside 1.618 Fibonacci Extension level priced at $11.09. This area of support is also bolstered by the initial starting level of the late 2017 bull run. Let us continue to analyze price action a little closer over the shorter period to highlight any potential support and resistance areas. Analyzing price action from the benefit of a shorter time horizon, we can see that the market has been further supported by a short-term downside 1.272 Fibonacci Extension level (drawn in green) priced at $12.02. We can also see that the market has been trapped within a narrow range over the past month. It has been bound between the downside 1.414 Fibonacci Extension level priced at $16.11 as the upper boundary and the downside 1.618 Fibonacci Extension level (drawn in purple) priced at $11.07 as the lower boundary of the range. If the recently-activated bearish pressure continues within the market, we expect immediate support to be located at the lower boundary of the range priced at $11.07. If the market drops further below this level, we expect further support to be located at the psychological round number handle of $10, followed by the short-term downside 1.414 Fibonacci Extension level priced at $8.48. Alternatively, if the bulls manage to keep the market above the lower boundary of the range and rebound, we expect immediate resistance to be located at the upper boundary of the range priced at $16.11. If price action can break out above the upper boundary of the range, we expect further resistance to be located at the downside 1.272 Fibonacci Extension level priced at $19.62. If the bulls can continue to drive price action even higher, we expect significant resistance to be located at the long-term downside 1.414 Fibonacci Extension level priced at $27.13. The technical indicators within the market have rapidly swung towards favoring the bears within the market. The RSI is now trading well below the 50 handle, indicating that the bears are currently fully in control of the momentum. If the RSI continues to remain below the 50 handle, we can expect the bearish pressure to continue within the market. Let us continue to quickly analyze price action for ZCoin relative to BTC over the long term. Analyzing price action for Zcoin relative to BTC over the long term, we can see that the market had experienced a bullish year throughout the entirety of 2017. Price action started from a low of 40,000 SATS on January 2, 2017 to an all-time high of 1.15 million SATS on December 25, 2017. This was a price increase totaling 2,200% from low to high. We can see that after placing the all-time high, the market rolled over and declined significantly throughout 2018. 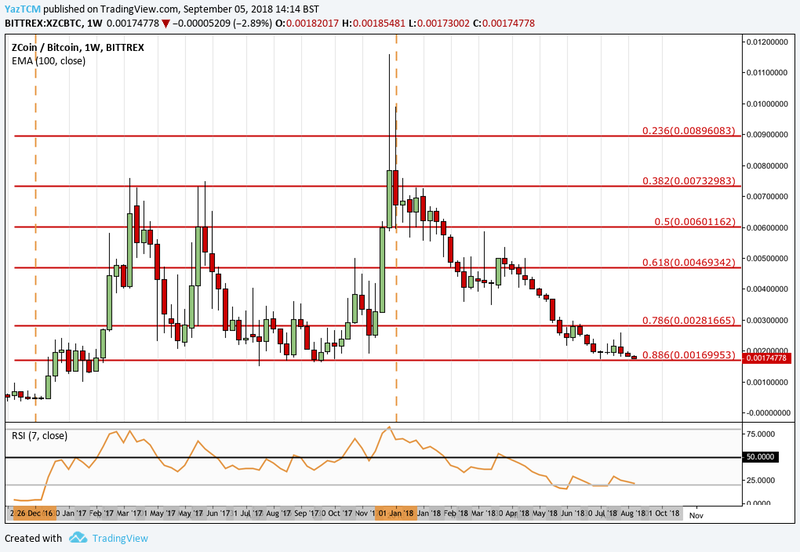 The market has declined a total of 92% from the all-time high to where it is currently trading at support located at the .886 Fibonacci Retracement level priced at 169,000 SATS. This Fibonacci Retracement is measured from the entire bullish run seen throughout 2017. Let us continue to analyze price action a little closer over the short term to highlight any potential support and resistance areas. 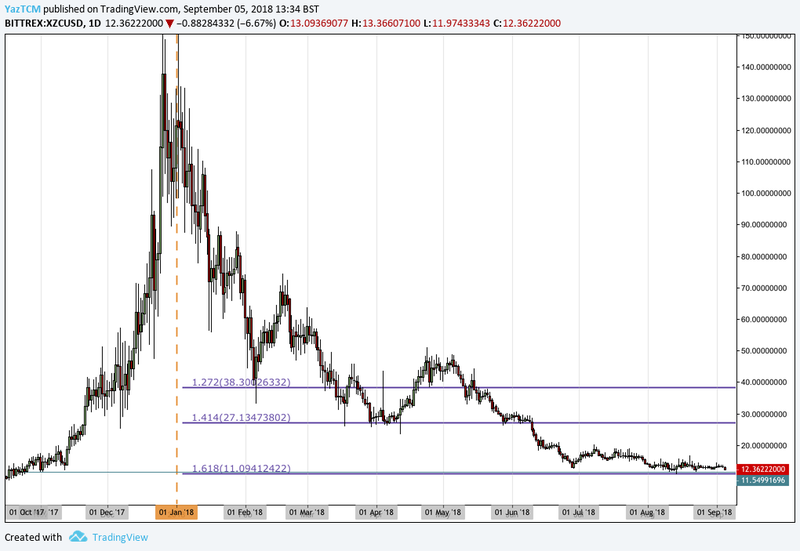 Analyzing price action from the short-term perspective above, we can see that, over the past 2 trading months, the market has been trading within a large range identified between the 1.414 Fibonacci Extension (drawn in purple) priced at 296,000 SATS as the upper boundary and the long-term .886 Fibonacci Retracement priced at 169,000 as the lower boundary. If the bearish pressure continues to push price action below the lower boundary at 169,000 SATS, then we can expect immediate support at the psychological round number handle of 150,000 SATS, followed by the short-term downside 1.272 Fibonacci Extension level (drawn in green) priced at 129,000 SATS. The technical indicators within the market are currently favoring the bears as the RSI trades well below the 50 handle. If we would like to see a recovery within the market, we would need to see the RSI break back above the 50 handle.